Sometimes I don’t understand where designers came up with their game ideas back in the classic era. In Spider Fighter you are charged with protecting your fruit orchard from legions of spiders who steal your fruit, which you do by shooting at them with a “bug blaster”. The bugs attack in waves. Each wave begins when a “master nest” appears on the screen, which releases two types of spider along with “spy pods” that let the master nest know when it is time to release more spiders. Although the strategy for the game outlined in the manual suggests that you shoot all of the spy pods first, so that the master nest will not release any more spiders, it is simply easier to just shoot the master nest quickly which will prevent any additional enemies from being dispatched before you clear the screen. I find the pace of the game to be much too frantic to facilitate target differentiation so a scorched earth policy works best. The game is intense enough that you get killed pretty regularly, but is so liberal in dispensing extra lives that you can gain proficiency in Spider Fighter much too quickly. The ultimate goal aside from survival is to protect the fruit, which the master nest will steal and carry out of the field of play if they are not killed quickly enough. If you are able to protect all of your fruit through 4 waves of insects, you automatically get an extra life. As this isn’t terribly difficult to do, even a mediocre player will quickly amass an army of extra bug blasters. Unlike similar games, Spider Fighter’s difficulty flattens out early on so that a seasoned player will continue to earn extra lives faster than they expend them. Activision’s high score patch for this game required a score of 40,000 which should have been easily obtainable within the first day one had the game. The difficulty issue aside, Spider Fighter carries on the same tradition of quality expected from an Activision title. The visuals and sound are better than almost any first party title, and the game runs fast and smooth which is impressive considering the high volume of stuff flying around on the screen. This game is a good “introductory” shooter that loses its value once your skills outgrow it. Buy Spider Fighter on GameGavel or Amazon. 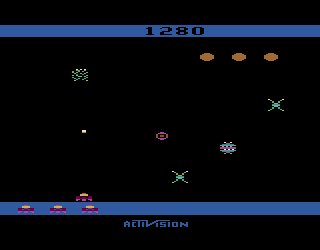 Tagged 2600, Activision, Arcade, Atari, Larry Miller, Review, Shooter, Spider Fighter, VCS. Bookmark the permalink.